The Iomab-ACT program is an expansion of Actinium's strategic focus on targeted conditioning and brings Actinium into the exciting field of CAR-T. Building on Actinium's expertise in targeted conditioning gained from its Phase 3 trial for Iomab-B, which is designed to produce myeloablation to facilitate a bone marrow transplant, Iomab-ACT is a natural progression to a lower dose of apamistimab - I-131 to produce lymphodepletion prior to CAR-T.
CAR-T is a revolutionary medical approach that has led to paradigm shifts in the treatment of patients with certain cancers. The rapidly evolving and crowded field of CAR-T is now filled by dozens of companies, including some of the largest pharmaceutical and biotechnology companies, who are working on over 200 CAR-T programs. Despite significant advances in the field of CAR-T, little innovation has been applied to a critical aspect of the CAR-T treatment process called lymphodepletion. 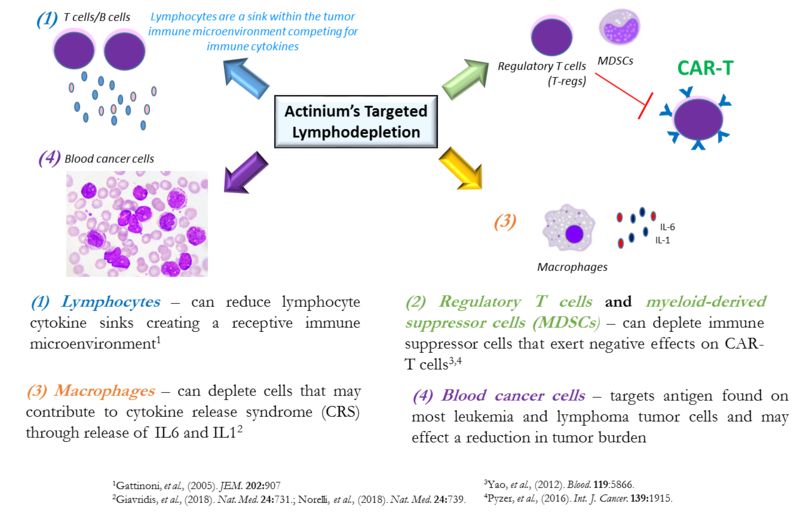 Actinium's Iomab-ACT program is intended to be a universal next generation targeted lymphodepletion solution for CAR-T. Actinium's approach is multi-modal and is intended to lymphodeplete and reduce the patient's tumor burden while also optimizing the tumor microenvironment by targeting regulatory T cells, myeloid derived suppressor T cells and cytokine secreting macrophages. All of these cells express CD45 and would therefore be targeted by Iomab-ACT. In doing so, Actinium believes the Iomab-ACT program has the potential to improve CAR-T efficacy and response duration through improved cell expansion and persistence. 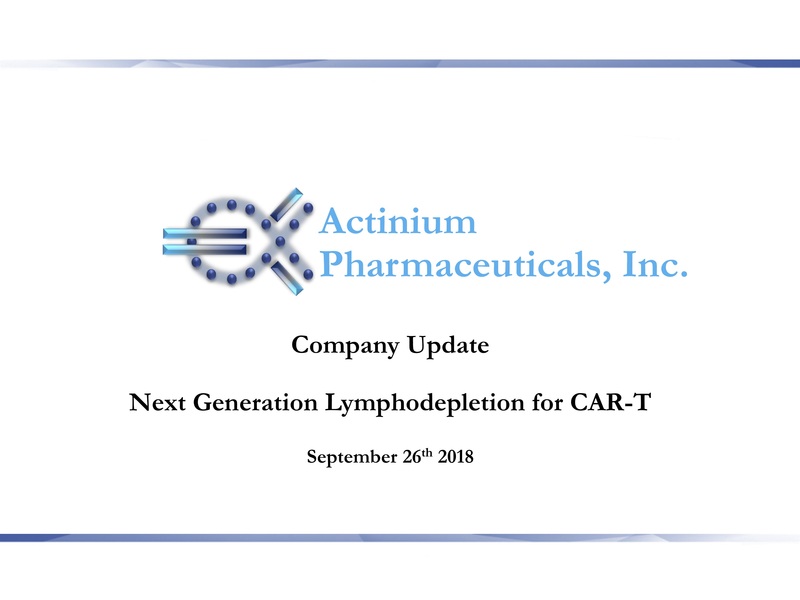 Also, through the reduction in macrophages and other cells, Actinium believes it can reduce toxicities such as cytokine release syndrome (CRS) and neurotoxity, which are potentially fatal and black box warning for approved CAR-T products. Actinium believes Iomab-ACT has the potential to address many limitations of CAR-T that are not addressed by current non-targeted, non-optimized lymphodepletion regimens such as Fludarabine and Cyclophosphamide (Flu/Cy) as highlighted below. Through targeted conditioning for lymphodepletion via the Iomab-ACT program, Actinium hopes it can improve CAR-T patient access and outcomes. 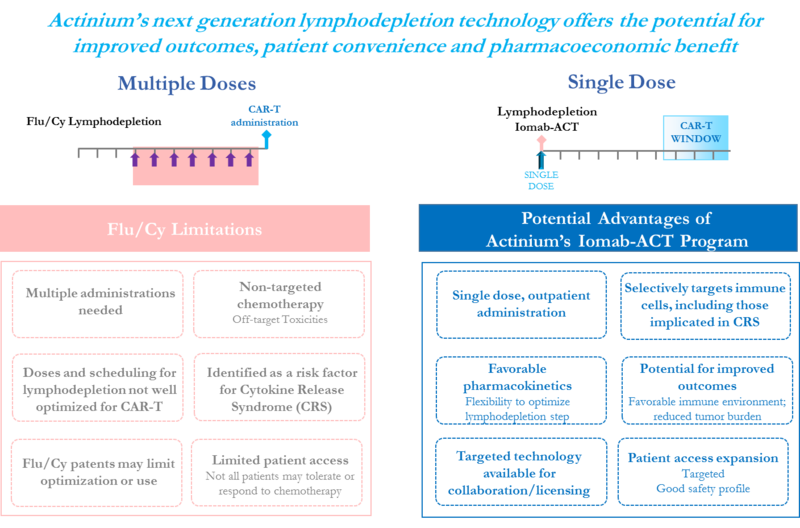 To learn more about Actinium's Iomab-ACT program for next generation lymphodepletion please contact IomabACT@actiniumpharma.com.